Book Review: The Second Day at Gettysburg: The Attack and Defense of Cemetery Ridge, July 2, 1863. In 1889 Joshua Chamberlain proclaimed, “In great deeds something abides On open fields something stays. Forms change and pass; bodies disappear; but spirits linger, to consecrate ground for the vision-place of souls.” He was speaking of Gettysburg, and course he was correct. As the war’s bloodiest and well-known, the three-day action will forever attract attention and study. Those students of the battle have for some of their newest reading the joint-effort by authors David L. Shultz and Scott L. Mingus Sr, The Second Day at Gettysburg: The Attack and Defense of Cemetery Ridge, July 2, 1863. This book is an excellent re-telling of a few bloody hours in the afternoon and early evening of the battle’s second day, as explained in the book’s introduction by respected Gettysburg Licensed Battlefield Guide James A. Hessler, whose own Sickles at Gettysburg forced readers to take another look at the Army of the Potomac’s Third Corps commander. Shultz and Mingus don’t look to give another re-telling of the fighting around the famed Round Tops, Devil’s Den, and Rose’s Wheatfield. Instead they focus their action north of action, using the Millerstown Road as their southern boundary and then working their way north and using the Bliss Farm as their northern wall. The action in-between is focused on with minute tactical detail, making this a book for those who want to know what every single unit within that district was doing at any given moment. The text is aided along with excellent maps drawn from Phil Laino’s Gettysburg Campaign Atlas. The book centers on Federal players high on the strategic level, mainly Winfield S. Hancock, before going down to the firing line with units such as the 1st Minnesota (whose famed attack is portrayed on the book’s front cover), to Francis Heath’s 19th Maine and George Willard’s brigade winning redemption and clearing themselves of the disappointing moniker ‘Harpers Ferry Cowards.’ Likewise, for the Confederates, the focus is given to Richard Anderson and his division’s attack consisting of Cadmus Wilcox, Carnot Posey, David Lang, and George R. Wright (with brigade commander William Mahone’s failure to advance being blamed on “divisional and corps leadership” (486). There are a few typographical errors that should look to be corrected in any future re-printings. John Bigelow’s battery, that sacrificed itself at the Trostle Farm, is labeled as the 9th Maine (289), Heath’s 19th Maine is at one point is referred to as “the Main men” (404) and in a couple of places George Willard’s middle initial is incorrectly given as H, not the correct L (492, 493). A mistake concerning Anderson’s division is when the authors list it as part of “A.P. Hill’s Second Corps” (314) when in actuality Hill commanded the Third Corps. Correcting these errors will only serve to make the book stronger. The Second Day at Gettysburg: The Attack and Defense of Cemetery Ridge, July 2, 1863 by David L. Shultz and Scott L. Mingus Sr.
494 pages main text, 531 pages total. 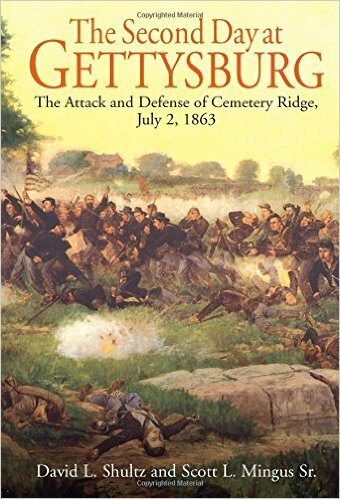 This entry was posted in Armies, Battles, Book Review, Books & Authors, Campaigns and tagged David L. Shultz, Gettysburg, Savas Beatie, Scott L. Mingus, The Second Day at Gettysburg: The Attack and Defense of Cemetery Ridge. Bookmark the permalink. 2 Responses to Book Review: The Second Day at Gettysburg: The Attack and Defense of Cemetery Ridge, July 2, 1863. Definitely a good read. I’ve walked this ground many times but can’t wait to walk it again and pay closer attention to more of the details contained in the book. Good to know that there is still much to be written about Gettysburg. Many thanks for this review, Ryan. The book sold out almost immediately and is being reprinted now. We have corrected the errors we found in the first printing.